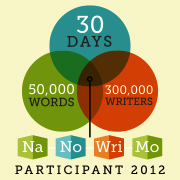 There’s an annual National Story Writing Contest called NaNoWriMo. It happens every year in November and participants have exactly 30 days to write furiously to come up with a 50.000 word novel. The idea is not to finish a masterpiece in this time, but rather to establish a daily routine in which the goal is to “do writing” rather than procrastinate, edit, try to perfect or think yourself out of a good idea. There are even local groups that come together and write in silence, but also to encourage each other to pull through to the magic 50k. Many creatives have often remarked that there is no special spark that needs to happen for anything creative to happen, it’s rather about “sitting down and doing it” and not about “thinking about it”. You know me, I’m up for a challenge – and it dawned on me that with such a cool writing tool as Storyist on my hands, plenty of forthcoming time ahead of me, and an amazing story to tell, NaNoWriMo is just what I need in the forthcoming twilight season I’d like to call Stateside. The first thing that struck me about NaNoWriMo is that it sounds rather tough: 50.000 words in a month means you have to write just under 2000 words every day, and if you skip a day this doesn’t get any better! But at the same time, 2000 words does not mean sitting there and writing for 10 hours straight either – it’s definitely doable with an hour or two of persistence each day. I’m moving house in early November – not just down the road but to a different country – so perhaps this isn’t the right month for me to participate in a venture like this… Or is it? Maybe a daily routine is just what I need with so much unknown future ahead of me. Especially considering that there’s no such thing as a McJob waiting for me at the other end. The more I thought about it, the more fascinated I became: I have a fascinating story to tell: the story of how Julia and I won a Green Card, the entire epic of finally getting it, but given that right now my life is actually really really nice, do I really want to move to the US right now? Throw my life away for a plan that sounded exciting when I was in my twenties? That’s the story! I’ve moved countries before, and I remember Oliver and I had an idea to write a book ever since. He’s an endless procrastinator so I know it’s never going to happen with him – but the idea is great. “Bei Köln Rechts” our book was called – it translates into “Turn Right at Cologne”, the only directions I gave him when he drove me all the way from Hamburg to London in 1999. It was crazy, and the story deserves a book. So does my current adventure: let’s call it Stateside. I’ve not really explored this journey yet which has taken over 2 years already. Now that I have 18 days to go until departure NaNoWriMo sounds like a godsend that makes me work on this. Perhaps it’ll turn into something like Bill Bryson’s “I’m a Stranger here myself”, but from a German guy’s perspective who’s been living in London for 13 years. The identity crisis that comes with it alone would fill a book. Let’s see if I have it in me to follow it through – Miami Beach has a superb creative effect on me, one that I’d like to make good use of from the moment I set foot on my new home soil. PS: This post has just under 650 words and it took me about half an hour to write – it’s really not that difficult (he says now having started the challenge yet). Want to be writing buddies? Here’s my profile on NaNoWriMo.